The Ultimate Game of Wizard's Combat. Take on the role of one of the great Master Summoners of Thranok as they wage war for total control of the realm's magical source! As one of these powerful wizards, you will manage your magical resources and use them to summon powerful champions from your homelands to aid you in battle as the struggle for magical supremacy mounts. Strategically deploy allies from your abundant resources. Seek out temples where your warriors can gain the upper hand in combat. Conquer and defend powerful keeps that contain the ultimate prize, the mystic Shezarian Stones! 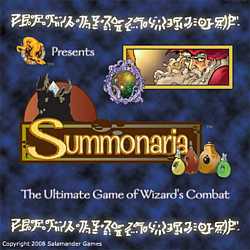 Summon and command armies of noble warriors, enchanted creatures, hideous monsters and ghastly undead in a struggle to seize control of the stones and wield the power of the ancients! Enter the world of Summonaria™ and dominate Thranok's destiny. Note this is the 2nd version of the game with a new and fully illustrated game board and variant rules to asllow you to customise gameplay.